Just like the mysterious meaning of the card, the astrological symbolism of The Moon can be misleading. 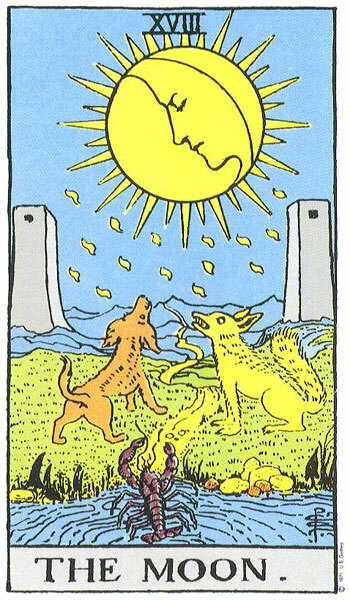 Though it seems only natural that the card would correspond to the moon, it's actually associated with Pisces, the sign of secrets and the subconscious. Pisces is a mutable sign, which means that its energy is changeable and always in a state of flux. Similarly, the moon depicted on the card is constantly shifting, its shape in perpetual motion. When you draw The Moon, it may be a sign that your life is shifting in a way that you don't yet recognize or understand. Be on the lookout for subtle clues and messages to solve the mystery. When Pisces is in play, things may not be exactly as they seem. The sign's ruler, Neptune, can symbolize illusion and deception. The Moon is also a warning to watch out for clandestine events and skeletons in the closet. Just as the moon appears in the dark of night, this card urges us to examine what's lurking in the shadows. But The Moon isn't only about things that go bump in the night! Pisces's ruler, Neptune, links this card to another member of the Major Arcana: The Hanged Man. Both cards are a reminder to hold your horses and contemplate your choices before moving ahead. The Moon and The Hanged Man both herald a time of suspension, where it's best to shift your focus to the spiritual. Listen to your dreams and intuition when these two come up, and you'll find what you need in order to move ahead.